Plymouth, Indiana – October 19, 2015. 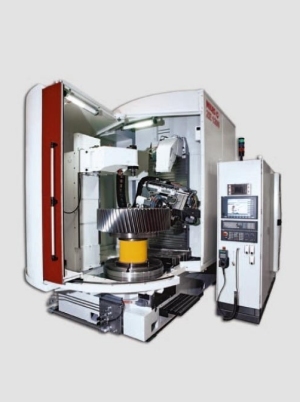 Indiana Technology and Manufacturing Companies (ITAMCO) recently purchased two Kapp Niles gear profile grinding machines, at a cost of over three million dollars, that will further ITAMCO’s leadership as a precision open-gearing services supplier to their customers in the energy industries. 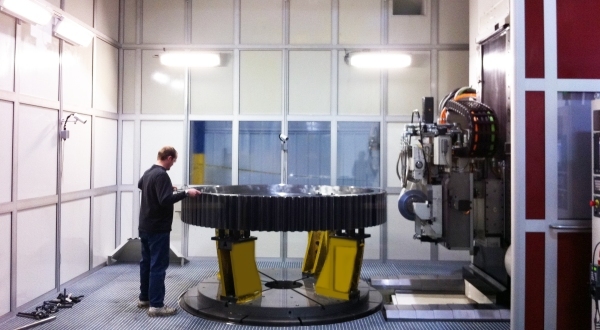 ITAMCO is one of the largest independent gear manufacturers in the world, capable of producing gears that are up to 4 meters (13 ft.) in diameter and weigh up to 80,000 lb. Helical—and Double Helical. (Gear grinders are the giant machine tools for cutting the teeth of internal or external gears.) The ZE 1200 can grind gears up to 1200 mm (4 ft.) and the ZPI 25 can grind gears up to 2500 mm (8 ft.). The ZPI has a unique grinding head that swivels so it can grind from external to internal with a very simple and fast setup, saving production time. The ZPI also features an onboard measuring system that makes it the ideal gear grinder to meet the requirements for increased size and high precision for the energy industry. The hardware and software features of the new grinders will enable ITAMCO to take hours out of the grinding process and ensure a quality level that meets DIN and AGMA standards. The new machines will join the extensive gear grinder inventory already in use at ITAMCO, including the Kapp Niles ZP 40, one of the largest machines of its kind and the only such machine in the United States, and eight CBN gear grinders. The new equipment will be installed in ITAMCO’s temperature-controlled precision grinding center in their 385,000 sq. ft. Northern Indiana facility. 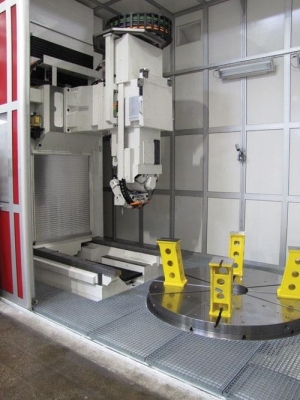 To further accommodate the production of large-scale gears, ITAMCO utilizes Zeiss Coordinate Measuring Machines that are ideally suited to verify very large gears, and the manufacturing facility has two overhead cranes, one with 40-ton capacity and another with 10 ton-capacity, ample loading docks and a rail connection. In addition, ITAMCO has received ISO 9001-2008 certification. ITAMCO combines their manufacturing capabilities with Autodesk design/engineering software so they can oversee the entire process for their customers.In fact, ITAMCO’s engineers create digital models of the gears before production even begins. The result is the ability to manufacture gears to submicron tolerances. This level of precision is crucial because a precisely manufactured gear performs better. A tighter tolerance and more accurate fit mean less noise and less vibration, which can cause other components to fail. Beyond producing less noise and vibration, a precisely manufactured gear will last longer. It won’t prematurely fail, and it will be able to handle more torque—both are critical aspects for machinery that must meet the extreme demands of the energy industry. “We have so much control over the entire process, from raw material procurement to finished product, that we can significantly reduce lead time and pricing, and no one can beat our quality,” said David Neidig, Director of Business Development for ITAMCO. ITAMCO’s gears are used in some of the nation’s leading top-drive drilling systems, which are primarily—though not exclusively—used on land-based oil wells. As mentioned before, an ITAMCO gear delivers more torque to better facilitate the drilling of a borehole. The jack-up rigs that search for oil and gas deposits in the sea use helical planetary gear units, connected by racks and pinions, to raise and lower their platforms. These platforms can weigh as much as 6,000 tons yet must be able to accommodate the ever-changing surface of the water. ITAMCO specializes in severe duty planetary gear systems. Hydraulic fracturing (fracking) relies on fracturing drives with spinning gears that provide as much as 3000 Hp (2237 kW) of pumping power. The gears have evenly spaced gear ratios to provide smooth shifting for pumping.The gears also give a broad range of pumping speeds. A deep first gear ratio allows pumping at lower flow rates and pressure, giving greater flexibility. Applying torque smoothly throughout the horsepower range optimizes productive horsepower and reduces stress on the entire powertrain. It also ensures that users have the appropriate amount of pressure to keep underground piping free of blockages so underground veins of gas can be explored more effectively. Heavy-haul surface mining trucks transport coal from remote mines to power plants. These trucks rely on a special type of gear known as an electric motor wheel planetary ring gear.These gears enable a truck to climb up steep continuous grades which reduces the amount of time required to get from point A to point B. It also makes getting down the hill easier by providing full retarding capability. This simply means that the truck can be fully stopped without applying the brake pedal, thereby reducing brake wear and lengthening the intervals between brake servicing. Once they’re off the hills and on to the roads, proper gears ensure that the trucks can obtain higher overall speeds—further increasing productivity which reduces the overall cost per ton of sourcing and transporting coal. Since 1955, ITAMCO has provided open gearing and precision machining services to most heavy industries including energy, mining, marine, and aviation. Learn more about ITAMCO at www.itamco.com or call (574) 936-2112.